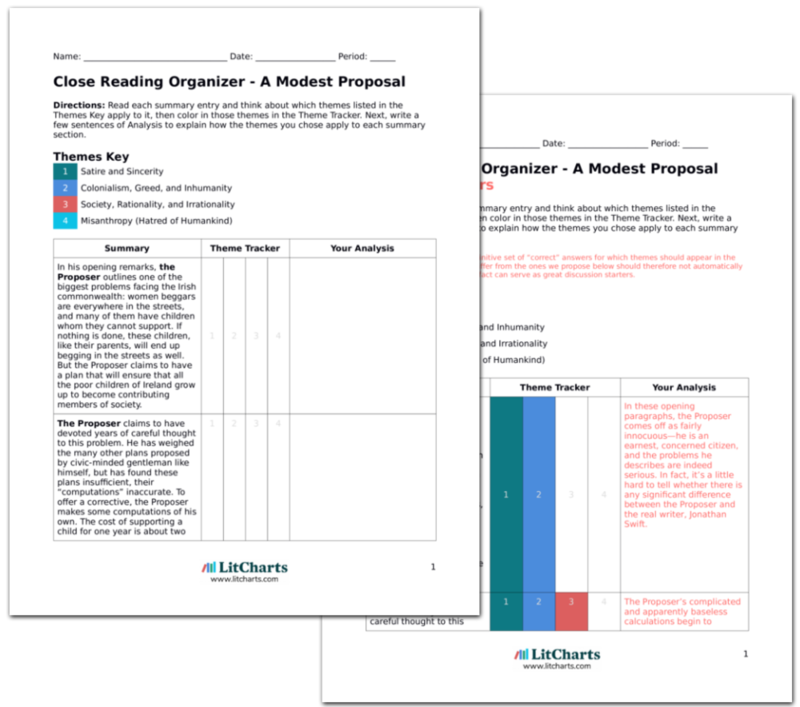 Instant downloads of all 946 LitChart PDFs (including A Modest Proposal). Welcome to the LitCharts study guide on Jonathan Swift's A Modest Proposal. Created by the original team behind SparkNotes, LitCharts are the world's best literature guides. A concise biography of Jonathan Swift plus historical and literary context for A Modest Proposal. A quick-reference summary: A Modest Proposal on a single page. In-depth summary and analysis of every of A Modest Proposal. Visual theme-tracking, too. Explanations, analysis, and visualizations of A Modest Proposal's themes. A Modest Proposal's important quotes, sortable by theme, character, or . Description, analysis, and timelines for A Modest Proposal's characters. Explanations of A Modest Proposal's symbols, and tracking of where they appear. An interactive data visualization of A Modest Proposal's plot and themes. Jonathan Swift was born in 1667. His father, a Protestant Englishman who moved to Dublin during a period of increasing English settlement in Ireland, died just months before Swift was born. Despite this, and thanks to the generosity of a few relatives, Swift received the best education possible in Ireland. He attended Trinity College, Dublin, received a Master of Arts degree from Oxford, in England, and was eventually ordained as an Anglican priest. As a young man, Swift shuttled between Ireland and England often. During this period he became increasingly invested in English politics. He gained notoriety for his impassioned essays on religion and all matters of domestic and foreign policy, and for his works of biting satire. A Tale of a Tub (1704), his first major prose work, mocked intellectual pedants and religious fanatics alike. In 1713 Swift was appointed as the Dean of St. Patrick’s Cathedral in Dublin, and in 1714 he settled permanently in Ireland. Swift was sympathetic to the plight of Irish Catholics under English rule, and wrote frequently in defense of their cause. His frustration with the political situation in Ireland culminated in A Modest Proposal (1729), a bitter and darkly hilarious satire of English indifference to the suffering of the Irish poor. Today, Jonathan Swift is most remembered for Gulliver’s Travels (1726), his complex, fantastical parody of utopian literature and early-modern travel narratives. He died in 1745. 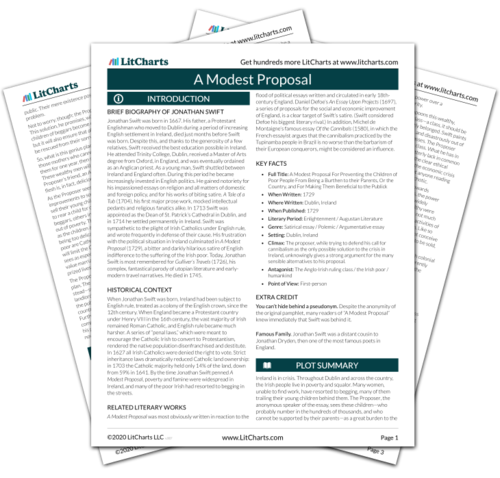 Get the entire Modest Proposal LitChart as a printable PDF. When Jonathan Swift was born, Ireland had been subject to English rule, treated as a colony of the English crown, since the 12th century. When England became a Protestant country under Henry VIII in the 16th century, the vast majority of Irish remained Roman Catholic, and English rule became much harsher. A series of “penal laws,” which were meant to encourage the Catholic Irish to convert to Protestantism, rendered the native population disenfranchised and destitute. In 1627 all Irish Catholics were denied the right to vote. Strict inheritance laws dramatically reduced Catholic land ownership: in 1703 the Catholic majority held only 14% of the land, down from 59% in 1641. By the time Jonathan Swift penned A Modest Proposal, poverty and famine were widespread in Ireland, and many of the poor Irish had resorted to begging in the streets. A Modest Proposal was most obviously written in reaction to the flood of political essays written and circulated in early 18th-century England. Daniel Defoe’s An Essay Upon Projects (1697), a series of proposals for the social and economic improvement of England, is a clear target of Swift’s satire. (Swift considered Defoe his biggest literary rival.) In addition, Michel de Montaigne’s famous essay Of the Cannibals (1580), in which the French essayist argues that the cannibalism practiced by the Tupinamba people in Brazil is no worse than the barbarism of their European conquerors, might be considered an influence. Climax: The proposer, while trying to defend his call for cannibalism as the only possible solution to the crisis in Ireland, unknowingly gives a strong argument for the many sensible alternatives to his proposal. You can’t hide behind a pseudonym. Despite the anonymity of the original pamphlet, many readers of “A Modest Proposal” knew immediately that Swift was behind it. Famous Family. Jonathan Swift was a distant cousin to Jonathan Dryden, then one of the most famous poets in England. Preston, Oliver. "A Modest Proposal." LitCharts. LitCharts LLC, 21 Nov 2016. Web. 23 Apr 2019. Preston, Oliver. "A Modest Proposal." LitCharts LLC, November 21, 2016. 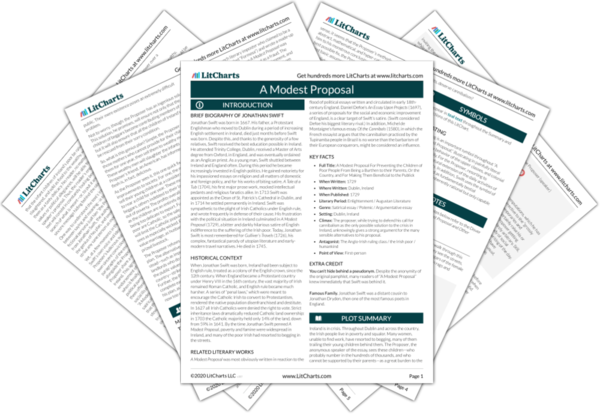 Retrieved April 23, 2019. https://www.litcharts.com/lit/a-modest-proposal.